It packs 1GHz Dual Core CPU on board which is sufficient for average usage. With 1GB of RAM, this phone seems promising. 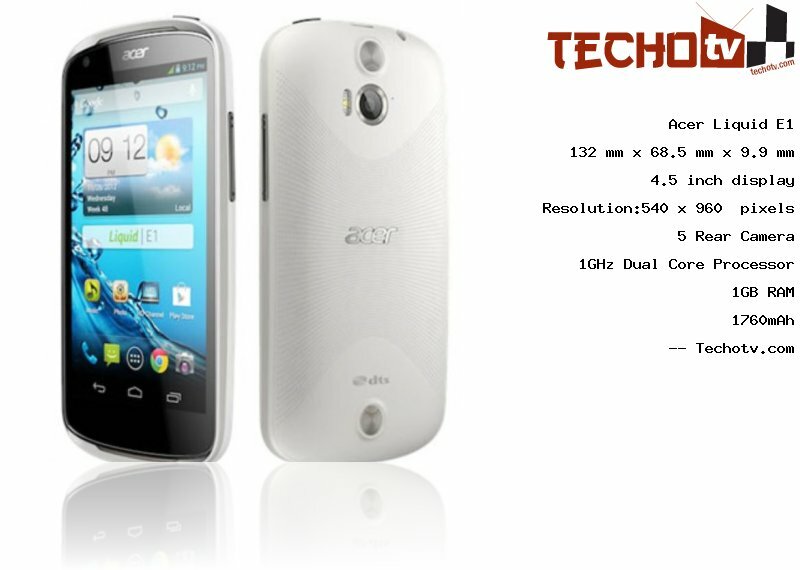 The screen resolution of Acer Liquid E1 phone is 960*540 pixels and the display is of 4.5 inch. The total pixel count leads to density of 245 ppi. It measures 132 mm x 68.5 mm x 9.9 mm. It has internal memory capacity of 4 GB. The primary camera at the back of device is of 5. There is VGA camera at front for video-calling and other needs. Sorry, The price of Acer Liquid E1 is not available at the moment. Our team is keeping an eye on online stores to get you the latest price as soon as available. Available in two color choices - 1. Dark grey with red accent 2. White with grey accent.